How children and teens think about and understand drinking, doing drugs, and smoking, is important to developing healthy attitudes and behaviors related to substance use. 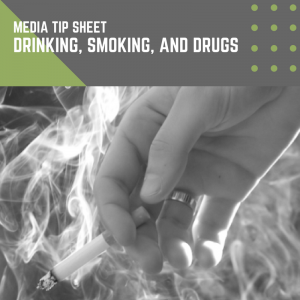 This tip sheet will help you understand how media portrayals of substance use can positively and negatively affect what children think and how they behave when it comes to drugs and alcohol. Use this information as a guide to help you choose media that are best for your child. Alcohol, smoking, and drugs are often glamorized in the media, which can lead children and teens to believe that substance use is common and even normal. Movies and TV shows usually do not show the consequences of substance use, which can lead to children believing that these activities are risk-free. Alcohol and tobacco advertisers can make their products look appealing to children and teens, such as vaping and drinking, especially when marketers use celebrity endorsement and attractive models. Children and teens who are exposed to media showing substance use may be more likely to use drugs, alcohol, or tobacco themselves. Provide them with the facts about drug use, drinking, and smoking, including pamphlets, movies, TV specials and websites recommended by a doctor, teacher or school nurse. Know what they are reading, watching, or hearing about drugs, alcohol, and smoking, and talk to them about the physical, social, and legal consequences of substance use. Teach children and teens to think critically about media portrayals of drinking, smoking, and drug use. This way, they will be better able to recognize when information is untrue or unrealistic. Keep the lines of communication open, so that your child knows that she can come to you with any questions or concerns about alcohol, drugs, or smoking, including any legal or safety concerns.